As my time as a participant in MSBA ends, it’s time to look to the next chapter. As a new alumnus of the program, I can’t help but feel intimidated by the accomplishments of the prestigious group I now find myself among. As I try to make my mark in sports business like so many before me, I am excited join my peers in the arena. Over the past week, I have taken the time to ask some questions to people within the MSBA family. I did this in the hopes of providing a different look into this tight knit community … enjoy. Q: What has been your favorite part about MSBA this year? Q: Who would win in a 1v1 basketball game between you and Jared Schoenfeld (Vice President of Brand Partnerships at The Players’ Tribune)? Q: What is your favorite thing about supporting MSBA? Q: What was your favorite moment of MSBA? Q: Fill in the blank: ______ from this year’s MSBA class would survive the longest on a desert island. Q: How has being a part of MSBA and contributing to the organization benefited you personally? Q: You’re starting an MSBA basketball team made up of 2018 MSBA participants, who do you take? Q: What is your favorite aspect of MSBA? Samson: The other day I ran into Michael Meisner, a fellow MSBA Alum, on the subway. 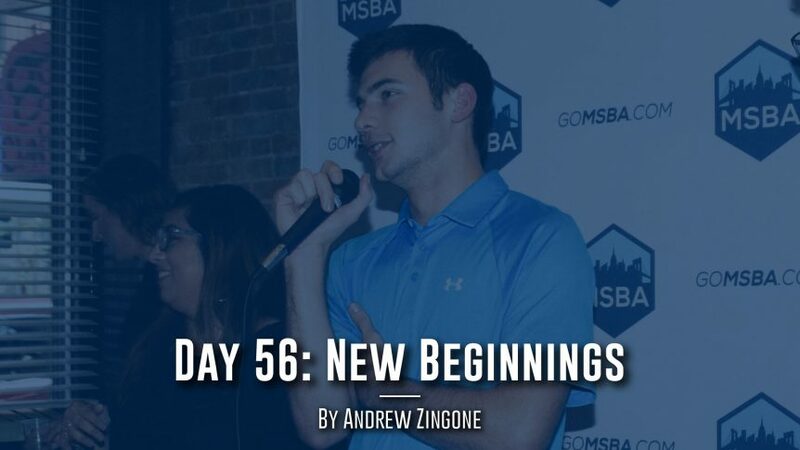 Now working at Excel Sports Management, which is an incredible opportunity, he began chatting with me and I found out that MSBA played an integral role in the opportunities that led him to the position he’s in today. It is crazy how MSBA can create such an immediate bond between Alumni as well as continue to open doors for past participants years after the conclusion of the program. Q: You were a participant in the first ever MSBA class with our very own Lorne Segall. Did you ever think he would one day be in charge of the day-to-day operations of the program? Samson: Short answer, no. Back then Lorne was the hardworking, lovable Canadian. Now though, it makes perfect sense. Lorne epitomizes the values of MSBA: you get out what you put in, and Lorne has given so much to MSBA. Q: What is the biggest improvement that you have seen in MSBA since you were a participant versus today? Q: What NBA Player does MSBA Co-Founder, David Oestreicher most resemble? Many people touched upon the MSBA community and the importance it plays in the growth and success of the program. With that in mind, I want to fast forward to what my class will look like in five years and make some predictions on how I see things turning out in the years to come. Prediction 1: John Regula will be Lorne Segall‘s successor as Program Director of MSBA. Prediction 2: Jake Salter will start a podcast to compete with Mark Zablow called “How I Got my Job with Jake Salter”. Prediction 3: Luke Murray will still be in college but will still be more successful than any of us. Prediction 4: Max Antonneau will be named the youngest GM in NBA history. Prediction 5: Andrea Galea will win Miss New Jersey for three consecutive years. Prediction 6: Claudio’s new clothing line, “Gang, Gang”, will have taken off and be the sole provider of MSBA gear. Prediction 7: RJ will be Commissioner of the Fortnite E-Sports league. Prediction 8: Five years later, the winner of the famous UNC vs Kentucky showdown is still disputed. All interviews and predictions aside, I have a lot of people to thank for my experiences this summer. David, Ben, and Jonathan: Thank you for creating a program that has allowed my peers and me to chase a dream that would be otherwise unattainable. Mark Zablow, Leo Parsons, and Logan Furr: Thank you for mentoring, sharing your experiences with, and providing your insights to me. Samson Feldman: Thank you for all of your candid advice and willingness to be interviewed for this post. MSBA Class of 2018 (including John and Grace): Thank you for a summer I will never forget. Please don’t hesitate to reach out if you need anything. Steven Tigani: You still hold the record for driving from Orlando to Jacksonville, and for that I thank you. Lorne and Bailey: Thank you for taking a chance on me and allowing me to be a part of this program. I could not be prouder to be a part of this community. My fun fact at the beginning of the year was that I was always last because of my last name. Thank you for continuing this trend by allowing me to write this final blog post. If you are someone who dug up this blog post looking to network with me and were willing to wade through all of those inside jokes that may or may not have been funny, congratulations. My phone number is (301) 943-3392. Feel free to text me anytime.